We offer comprehensive assessment, investigation, intensive therapy programmes and ongoing treatment to enable patients to manage their disabilities on an in-patient, out-patient and outreach basis. We use a patient-centred and goal-led approach to develop more effective skills and strategies for communication, eating and drinking, using a range of evidence-based therapies. We will also assess needs for assistive technology to enhance communication. We work closely with families, carers and other members of the multidisciplinary team, to ensure consistency and carry over of strategies and, above all, to achieve meaningful person-centred outcomes for each individual in our care. 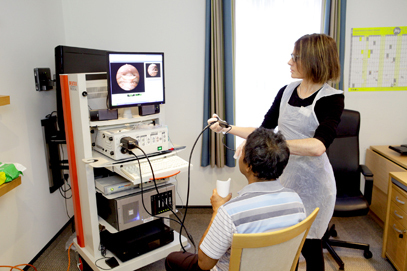 Instrumental assessments of swallowing using endoscopy and videofluoroscopy which provide an objective view of how you are swallowing food, drink and saliva and enable us to evaluate your swallowing function pre and post therapy. FEES (Fibreoptic Endoscopic Evaluation of Swallowing) enables us to see what is happening in your throat when you are swallowing. It uses a flexible laryngoscope with a very small tube with a camera and light on the end which is inserted into your nose and looks down your throat. The test assesses your ability to eat and drink and swallow saliva, depending on your individual needs. You will be able to watch what is happening on a computer screen during the procedure and afterwards. It shows if food, fluid or saliva is going ‘the wrong way’ down your windpipe, instead of to your stomach and which parts of the swallowing process may not be working well. We are able to determine what textures and consistencies of food and drink are safest for you to swallow and whether certain strategies or positions allow you to swallow safely. It helps us to set up a programme of intervention targeted to your individual needs. We have access to videofluoroscopy, an instrumental assessment of swallowing which uses video x-ray to examine your swallowing. The test takes place in an x-ray suite and you will be asked to swallow food and drinks of different consistencies, mixed with a liquid contrast. The speech and language therapist will assess what is happening in your mouth, throat and food pipe when you eat and drink. Similarly to FEES, the therapist will be able to see if there are any problems with your swallowing, including what if anything is ‘going the wrong way’. We will trial different techniques to see if this makes swallowing safer or easier. This test will enable us to determine the nature and cause of your swallowing difficulties and to identify the best treatment approach for your individual swallowing needs. Biofeedback systems for swallowing therapy. Using our state of the art Digital Swallow Workstation, including surface electromyography (sEMG) to help you to achieve your swallowing therapy goals using real-time visual feedback.